(P1) The Pew Research Center on Wednesday released a study about online harassment. According to the study, which asked 2,849 people about different forms of online harassment, 73% of respondents said they’ve seen someone else being harassed, whereas 40% of people say they experienced it for themselves. (P2) The study breaks up the harassment into two categories: less-severe harassment, such as name-calling and embarrassment. The other type of harassment is more severe: stalking, sexual harassment, and being the target of personal threats. 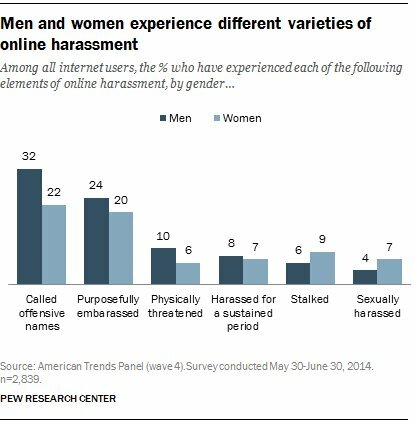 (P3) Overall, men are actually more likely than women to experience some type of online harassment — 44% vs. 37%. Men experience name-calling and are more likely to be targets of physical threats, according to the study. Women, however, are more likely to experience much harsher types of harassment, such as sexual harassment and stalking. (P5) And, according to the study, young women, ages 18-24, are the most likely to experience “severe” harassment, with 26% saying they have been stalked online, 25% saying they were targets of online sexual harassment, and 23% saying they were physically threatened. (P6) Online harassment has been in the spotlight recently — particularly in the gaming community, in light of the GamerGate controversy. The Pew study says 16% of respondents were harassed in an online gaming community, and in terms of gender, 44% of respondents said gaming sites are more welcoming toward men. (P7) The study was conducted in June, however, which is before the GamerGate controversy began. Describe different kinds of online harassment men and women experience (P3&4). How many (in percentages) are experiencing “severe” harassment and why? Has online harassment or trolling ever been brought up as a social issue in your country? Have you experienced online harassment? 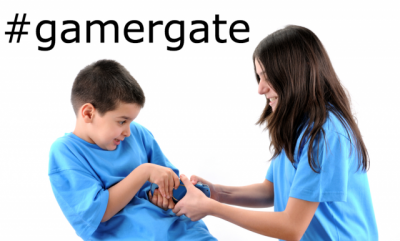 What do you think about GamerGate Controversy? Share your perspective with the tutor!